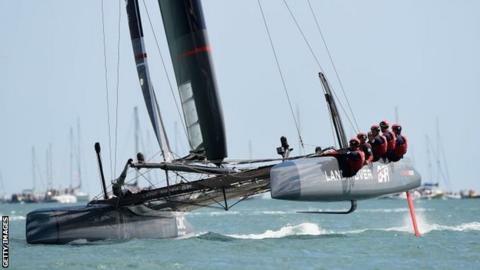 Ben Ainslie's boat is top of the leaderboard after the opening two races of the America's Cup World Series. Britain's most successful sailor had a first and second with his Land Rover BAR team in a field of six America's Cup teams in the Solent. Emirates Team New Zealand are a point behind in second with America's Cup holders Oracle Team USA in third. "We are not getting carried away," said Ainslie. "On Sunday, we race for double points so there is a long way to go." The four-time Olympic champion added: "It was emotional for us when we got out of the harbour entrance and saw thousands of boats out there. "I have never seen anything like that in my sailing career." It will be the 35th staging of the oldest competition in international sport which was first raced in 1851 around the Isle of Wight. It was named after a boat called America, which beat the best Britain could offer and a boat from these shores has never won the trophy.